I have known Tash Weddle for years, and have always admired her personally and professionally. It was time for me to put some structure around getting fit and strong, so I immediately thought of TNB Fitness. I feel like I have a much better mastery of my personal health and fitness. I feel 100 times stronger… It amazes me what the human body will do when you work with it. For the first time in my life, working out 3-5 times a week has become an engrained habit. I at first thought that this journey was about weight loss, and I’ve learned that it is not fundamentally about that. It has made me view myself and my relationship to my body differently. It has proven to me that I can achieve what I set my mind to. My husband keeps telling me that it has altered my shape, in a great way. Losing some weight has been a happy byproduct. I would call on the famous Nike slogan – best slogan ever written – of “Just Do It.” This is a safe place. Tash, Gabe, Marielle, and Mckenna are always looking out for your best interest and your safety. TNB is for every woman, every shape and size. They meet you where you are. And serendipity came into play and I happen to have a bunch of girlfriends who are training there, so we genuinely have fun. Giving Tuesday is on November 27th, 2018! Giving Tuesday follows “Black Friday” and “Cyber Monday,” two days devoted to consumerism, sales, and buying for the holidays. Giving Tuesday is a day to give back to others, the community, and shift focus from consumerism onto paying it forward for others! The New Beginnings Center, local non-profit that offers nutrition and fitness coaching to low-income women in Nashville, will be participating in Giving Tuesday. If you see fit, please donate to New Beginnings on Tuesday, November 27th, and help continue the mission of empower women to change the course of their lives! Is it true that being unfit is worse than smoking? The answer is… YES. Bottom line: "Survival of the fittest", that's a phrase that you would usually expect to read in a biology textbook, not in a study about human health and longevity... but wait: humans are animals and in the animal kingdom it's the fittest who survive - against that background, let me ask you: Is it really surprising that being 'super fit' vs. 'unfit' increases your all-cause mortality risk by a factor 5x, and hence 3.6-fold more than smoking in the same cohort of N = 122,007 patients of the Cleveland Clinic who were screened for their cardiorespiratory fitness? On October 4th, 2018, The New Beginnings Center had their 7th annual Spirit of Wellness Luncheon! We want to say a huge thank you to all of the TNB Fitness members who came and supported the New Beginnings Center at this event! If you were not able to make this event but would still like to show your support please click the button below to contribute to the cause! All new donor $1,000 donations made to The New Beginnings Center will be MATCHED! Doubling your impact and support of women in Nashville! Sips, Sweets, and Jewelry, all in support of The New Beginnings Center! Join us at Kendra Scott in Green Hills on Monday, November 26th, from 5:30-7:30pm for a shopping event! For this time only, 20% of the proceeds will benefit The New Beginnings Center. Knock out holiday shopping and give back to the community, all at once! Friends welcome - the more the merrier! What attracted you to TNB FITNESS/What motivated you to join TNB? I have always been a daily early morning exerciser and about 18 months ago, I changed jobs and began working out at a different YMCA in order to accommodate an earlier work start. That change in routine altered the fitness regimen I had been on and, with the stress of a new job, I found myself with some weight gain and had definitely lost strength and leanness. So when I happened into a conversation at a cocktail party where words like “transformational” and “life changing” were being used, I asked what they were talking about — TNB Fitness of course! The timing was perfect. I called Tash, went in for an evaluation and the rest is history. I feel great. I’m starting to get my lean muscle mass back, my energy is much higher and I know I am working smartly and safely with the individualized workouts and attentive trainers. My goals were to get leaner, stronger and, of course, lose a few pounds. I’m a “rules” girl and I’ve been very consistent and done everything Tash has suggested with both exercise and nutrition. It is truly a balance and one does not work without the other. It was taking longer than I wanted to start seeing results but I knew that I was doing the right things so I persevered. Now my clothes are fitting better and the scale is moving in the right direction. It feels wonderful. It is a most encouraging atmosphere and the attentiveness to form by the trainers is absolutely unparalleled. The staff is so knowledgeable about physiology, safety and what women of a certain age need to get and stay strong. If you want to stay motivated in a compassionate yet challenging environment, TNB Fitness is the place for you. I love it! ...a place that empowers me to be my best self. I love the social enterprise aspect that our fees help fund New Beginnings which gives other women the opportunity to take charge of their health and wellness. That’s the key before most any other change can be made. I’m a very goal oriented person. Nothing feels better to me than moving up to the next level or a heavier weight because it means I’m getting stronger. Lululemon Nashville has partnered with The New Beginnings Center for their #HereToBe non-profit partnership! All classes throughout the day will be a $5 donation and proceeds will benefit New Beginnings Center's mission to empower women through elite nutrition and fitness coaching, regardless of ability to pay! Get your weekend workout in and donate to a noble cause all at once! TNB Fitness members now have access to Defiance Fuel products, delivered to your doorstep, at 20% off! Basil Metabolic Rate (BMR) The measure of how much fuel your body burns. Phase Angel an indicator of overall health. Enjoy lunch while learning more about TNB Fitness's social enterprise The New Beginnings Center. Hear firsthand stories from clients and from President and CEO Tash Weddle! There is no cost to attend. A request for donations will be made. I’ve been working out at TNB Fitness for over four years now! I loved the fact that I’d be working out with other women in a clean, welcoming environment and that my workout routine would be customized to my specific needs. I also appreciated the FMS screening which provided a baseline fitness level and identified areas of opportunity for me to work on. Finally, I appreciated the nutritional counseling that TNB offers as part of the package. When I started at TNB, I could only do “girl” push ups and assisted chin ups. My previous trainer never challenged me to do more. Now I can do legit push ups and chin ups—all without assistance. It’s an awesome feeling to conquer something you never thought you could do! I also have more stamina and energy and the self-confidence to accomplish anything I want to do. 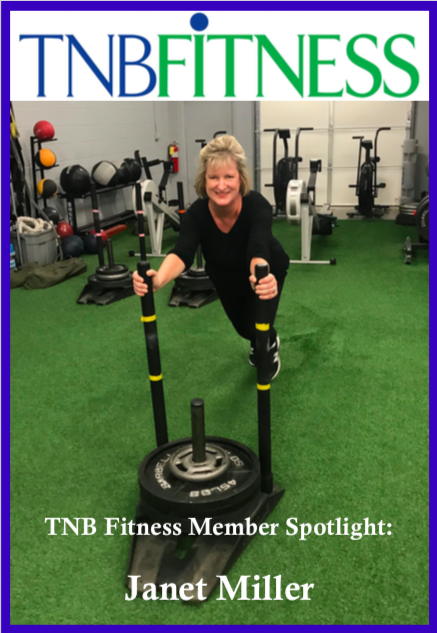 Examples of accomplishments after joining TNB include running in a 5K race, indoor rock climbing and scaling Mount Le Conte in the Smokies—all after the age of 60! As I approach the golden years of my life, my main fitness goal is to maintain my strength so I can remain independent as long as possible. I can honestly say that TNB has far exceeded my expectations relative to that goal. I am stronger than I’ve ever been in my life and as healthy as I was in my 20’s and 30’s. Based on my experience, this is the best, most effective workout model in the Nashville area. You won’t get a better return on investment in your most precious assest—your health and welfare! Did you check in for your workout?! Through the month of June join us in a Facebook check-in contest! Whoever has the most check-ins at the end of the month will win a prize! With your help The New Beginnings Center raised well over $11,000 in this year's #BigPayback - the most we've raised in this event to date! We couldn't have done it without YOU and appreciate every contribution that was made. Thank you for your continued support! Are you, or someone you know, looking for a place to volunteer a few hours per week? If so... We are currently accepting new volunteers to start with our next round of New Beginnings Classes on July 10th, 2018! Commitment is every Tuesday & Thursday evening for 12 weeks. Help women on their fitness and health journey, expand your own knowledge, and be an additional source of encouragement! Email Marielle at msuddarth@tnbcenter.org if your are interested in volunteering or learning more! Join us for our next vision board workshop on Saturday, June 2nd, from 11AM-12PM!